Pakistan Navy is the Military Forces that is based on the border based force for the defense of Pakistan. If you want to join the Pak navy so you must apply within due dates because navy has announced the various jobs 2017 for the eligible candidates. Pak Navy Jobs are announced so now you can join Pakistan Navy through Short Service Commission Course 2017 here we are providing you’re the application forms and online registration and its process. Below provided the eligibility criteria if you are meeting the criteria you are eligible are not, if you are so you must apply. Also selection procedures are available here. Registration procedure and last date will be provided to you on this page. For the joining navy force you must clear the ISSB test but Major problem is the ISSB test syllabus but you should not worry about it because we are solved problem and we are providing you online testing service for the preparations. You attempt these test and improve your knowledge and get online preparation to clear the ISSB test (written test, verbal test, non-verbal test, Intelligence test). Pakistan Navy jobs short service commission course 2017 Registrations online is provided below by the official sources. Pak Navy Jobs are available in different branches like Operations Branches Marines & SSG. Education Branch, Education Branch Psychologist, Medical Branch-GDMOS. Candidates must apply on due dates because after due date application forms will be acceptable. 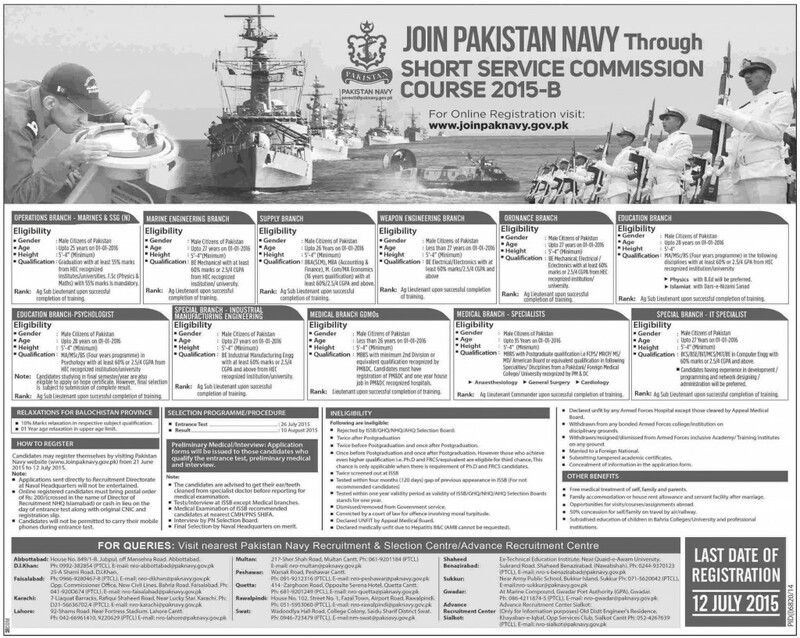 Every year short service commission course jobs introduce by the Pak Navy and candidates are selected according to the Pakistan Paramilitary Navy recommended selection criteria. First of all you should submit the registration form and then you will be able to appear in the written test. After the written test you will be proceeded further for physical test , medical test and after all test clearance you will be refer to the interview session and Interview will be conducted by the Pak Navy. After the interview clearance selected candidates will called for the training. So we are advancing you again that We are providing the online testing for preparation without any cost.